Egypt has asked the UAE to intervene directly and help resolve its ongoing dispute with Ethiopia over the Renaissance Dam which Ethiopia is building near its border with Sudan. Over the past two weeks, Crown Prince of Abu Dhabi and Deputy Supreme Commander of the UAE Armed Forces, Sheikh Mohammed Bin Zayed Al-Nahyan is reported to have met with Sudanese President Omar Al-Bashir and Ethiopian Prime Minister Hailemariam Desalegn to discuss a solution to the crisis. The Sudanese president who visited Abu Dhabi twice in one week while the Ethiopian Prime Minister was in the UAE, announced yesterday that he will visit Ethiopia and meet the Ethiopian premier to discuss the issue. The visit comes a few days after Al-Bashir said Sudan did not support Ethiopia in its dispute with Egypt. Egypt’s former Assistant Foreign Minister for African Affairs, Ambassador Mona Omar, said Cairo raised the issue with Gulf states during the Africa-Arab Summit in Kuwait in 2013. “We talked with the Gulf states clearly; because there is a large Gulf investment in Ethiopia in the field of agriculture,” she said, adding: “Egypt’s coordination with Gulf countries comes within the framework of using every possibility to resolve the problem peacefully after talks reached a dead end”. 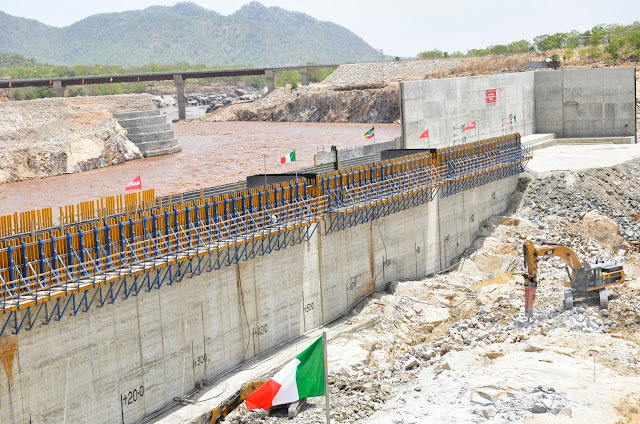 Ethiopia expects to complete Africa’s largest hydroelectric dam the Renaissance Dam on the Nile in 2017.